I’ve got sunshine, on a cloudy day… Sunshine, on my shoulders makes me happy… Good day, Sunshine! 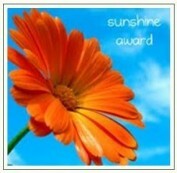 Last week, Love Life Infinity nominated me for a sunshine award. According to LLI, this reader-forwarded honor is “specially given to those who are earnestly inspire others by their inspirational ‘arts’ in the blogosphere.” Holy cow. I never aimed for inspirational; I had set my sights on informative, interesting, and hopefully somewhat insightful. To be called inspirational is a bit overwhelming for me. Thanks, LLI! According to the rules of the award, I must answer 10 questions and similarly nominate 10 blogs. It’s a clever way to turn people on to interesting reading material while helping fellow bloggers increase their exposure and, hopefully, their readership. Count me in. 3. Or 9. Or 39. As if it matters. I love dogs, especially big ones. I used to have a bull mastiff who stole my heart. Here’s my Facebook URL, but I’m fairly judicious about friend requests. On Twitter, I’m @tampyd. I don’t tweet a lot. I love the dusk hours, when the sky settles into a rich cerulean blue. I see houses come alive with light as people return from the workday and gather at their tables or settle onto their sofas. It sets my imagination whirling, spinning stories of what might be. The best vacation EVER was my bicycle trip through Tuscany. My aunt and I celebrated our 100th birthday–her 60th and my 40th–together with my uncle and many new friends we made on the trip. Wonderful company, wonderful food, wonderful scenery, wonderful time. And where else can you get a really good cup of coffee for 90 Euro cents? And in a porcelain cup, no less! The very best souvenir from that trip was a fast friendship with Sally, whom I met on that vacation. Running, when I’m really on my game. I love the smell of lilacs, the grace of calla lilies, the delicacy of lilies of the valley, the sunshine of daffodils, the elegance of orchids, the jauntiness of tulips, the cheer of Gerber daisies… I think I love them all, especially in big bunches or when they’re delivered unexpectedly to my door. Words are my passion, in all forms. A witty jibe, a carefully crafted sentence, a clever retort, a double entendre, or a straightforward “I love you.” Spoken or written, mine or someone else’s. (Usually someone else’s!) Grammar, spelling, syntax, reading, and writing all fit in there somewhere, too.